Description: Our brochure printing service gives you A6 hard cover brochures printed in full colour. Our brochures are printed on eco-friendly paper from sustainable sources. Our prices include FREE delivery within 7 working days to one UK address excluding Highland and Islands and there is no charge for debit or credit cards. For deliveries to Highland and Islands please call for a price that includes delivery to these locations. 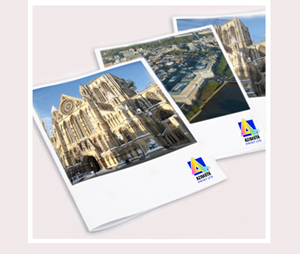 If you need your brochure printing sooner, contact us to discuss a quicker delivery time. Order FREE samples without any risk and see for yourself the quality of our products! Other quantities of brochures and paper weights also available for request. Azimuth Print provide template PDF files to help you create your artwork. Our Artwork Templates page allows you to download these templates FREE. Excellent to work with and, so far, superb print quality. A printer I can trust to do the job well! Mike and the team are always to helpful and professional. Always happy with the service, turnaround time and quality of the goods. A Germany-based global provider of specialty pharmaceutical labeling solutions, Schreiner MediPharm, has been recognized with a World Label Award 2014 for its Pharma-Tac Plus hanging label. Azimuth Print has an average service rating of 4.9/5 based on 447 customer reviews independently verified by eKomi.